Prepare yourself for an enchanting world with mystical characters, where imagination is encouraged and dreams are realized in the awesome Secrets of the Forest slot by High 5 Games and IGT slots, free at Slotorama! Secrets of the Forest is a gorgeous game with fairies and all of their magical powers gracing the reels set among the forest trees. In fact on the reels you’ll find three different fairy beauties to accompany you on your voyage. You’ll also find other symbols like the game’s logo, card symbols Q, K and A, a wild and a free games symbol. The game features Tumbling Reels, which gives you even more chances to win, because after a winning line is recorded, symbols from higher lines tumble into their place, creating brand new possibilities for big scores. You can also win a bonus round if you land three bonus triggers, sending the game into free spins. Wilds – The Wild symbols is easy to spot as it simply says WILD across it. It appears on reels 2, 3 and 4 and will substitute for all symbols on the reels except the Free Games symbol, to complete winning combinations when possible. 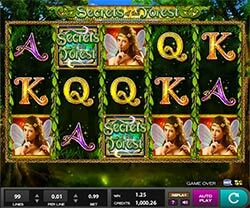 Free Games – Land three free games symbols on a played line on reels 1, 2 and 3 to win yourself 1, 2, 3 or 4 free games! This is a great chance to beef up your bankroll as you can get additional wins for the same bet you used to trigger the feature round. Tumbling Reels – All winning combinations trigger the Tumbling Reels feature. When this is triggered, all symbols in winning combinations disappear and the empty positions are filled with new symbols tumbling from above, giving you the opportunity for new wins!